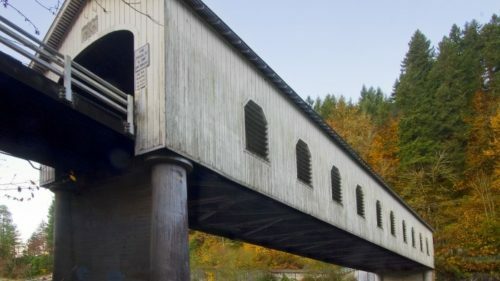 Transport yourself back in time on this relaxing 20-mile/32- kilometer ramble through Lane County, home to the largest collection of covered bridges in the West. Most are open to bicycles and pedestrians; some still handle vehicle traffic. Your bridge tour begins along Row River Road, traveling east from I-5 exit 174. 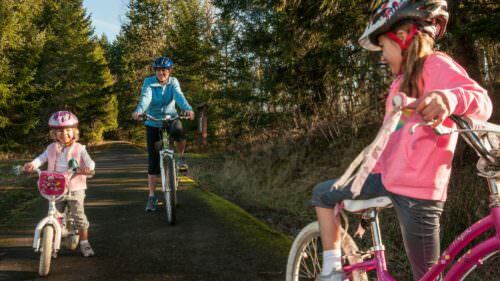 The tour route parallels much of the Row River Trail, a 16-mile paved trail and part of the Covered Bridges Scenic Bikeway. The Currin Bridge spans the Row River at Layng Road. It’s Lane County’s only two-tone bridge, with white portals and barn-red sides. Both the tour route and the bike trail wind southeast along Dorena Lake’s undulating shore. The Dorena Bridge stretches across the Row River at the far end of the lake, built in 1949 in conjunction with the Dorena Dam. The tour route swings back west along Shoreview Drive and Garoutte Road to the 1930 Stewart Bridge, spanning just 60 feet/18 meters across gentle Mosby Creek. A mile north on Mosby Creek Road, Layng Road threads through the Mosby Creek Bridge. Built in 1920, this 90-foot-long charmer is Lane County’s oldest covered bridge. Its single lane remains open to vehicles in both directions. Mosby Creek Road continues west, paralleling the Row River Trail and becoming Main Street as it approaches downtown Cottage Grove. At the corner of Main Street and River Road, volunteers constructed the Centennial Bridge in 1987 to commemorate the city’s 100th anniversary. With repurposed materials from two Lane County bridges, it rests on the city’s old Main Street Bridge abutments. 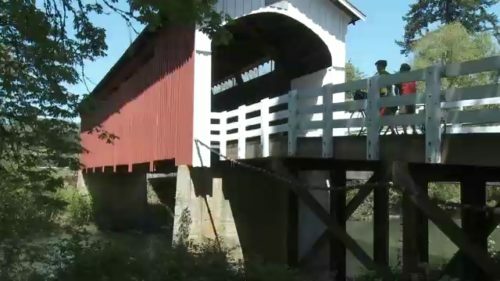 A half-mile/0.8 kilometers south on River Road, the Chambers Bridge is believed to be the only covered railroad bridge remaining west of the Mississippi. Built in 1925 to transport logs by rail to a local mill, it was near collapse when Cottage Grove obtained it in 2006. Fundraising from local citizens saved this treasure, which was rebuilt in 2011. Order a free Oregon Scenic Byways guide, or view a map of the Cottage Grove Covered Bridge Tour Route online.